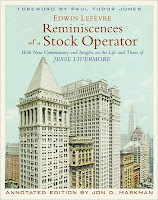 Reminiscences of a Stock Operator was originally written in 1922 as a first-person fictional account, but is now generally accepted as the biography of stock market whiz Jesse Livermore. The book is recommended to traders and value investors alike, for the lessons it teaches the reader in human behaviour as it pertains to securities trading and investing. Livermore speaks to the many tales that have been told about his trading prowess. Everyone from the media to his close friends have all exaggerated his ability. They speak of how he receives hunches in the middle of dinner that cause him to act just then, resulting in a sale (or purchase) right at the market top (or bottom). These "hunches", Livermore argues, are nothing more than his mind (including, at times, his subconscious mind) mulling over the various facts that govern whether a security is to break higher or lower. One of the pieces of information in which Livermore places great importance in forming his trading opinions is the level of insider buying/selling. But the information on insider buying/selling only comes out much later, and therefore Livermore tries to determine it right then and there by reading a stock's ticker (i.e. looking at past prices). In combination with a stock's fundamentals and the state of the macroeconomy and industry, Livermore tries to determine (with test trades described in an earlier chapter) whether insiders are participating. If insiders are not bolstering an undervalued stock with their own buying, for example, he often sees this as a signal that something is wrong with the company. At other times, however, the economy and general market conditions will cause him to trade opposite insiders. Many times, insiders have promoted their stock by releasing positive news or spreading rumours that are bullish. In such cases, Livermore will again test the market to determine if insiders are actually buying. If there is no resistance (e.g. the price moves down as a result of his sale transaction), he will trade against the stock despite the actions of other market participants who are reacting to the news. q1.whats the significance of free cashflow to sales ratio ? what percentage may be considered above average? q2.what is the importance of free cashflow?what can be considered bargain levels? q3.what are the risks that come to ur mind while investing in a investing company with minimal debt which is trading at a massive discount to the value of securities it owns? I answered these questions on the page you first asked them here. Sorry for the delay; I actually answered them a long time ago, but for some reason the comment went to blogger's spam comment box, but I was able to re-publish it yesterday.